The MEDTEQ facility has a medium range of test equipment as detailed below for testing to various standards. MEDTEQ reports have the equivalent status of a manufacturer's report, which is acceptable under medical device regulations for many regions, such as US, Europe, Canada and Australia. 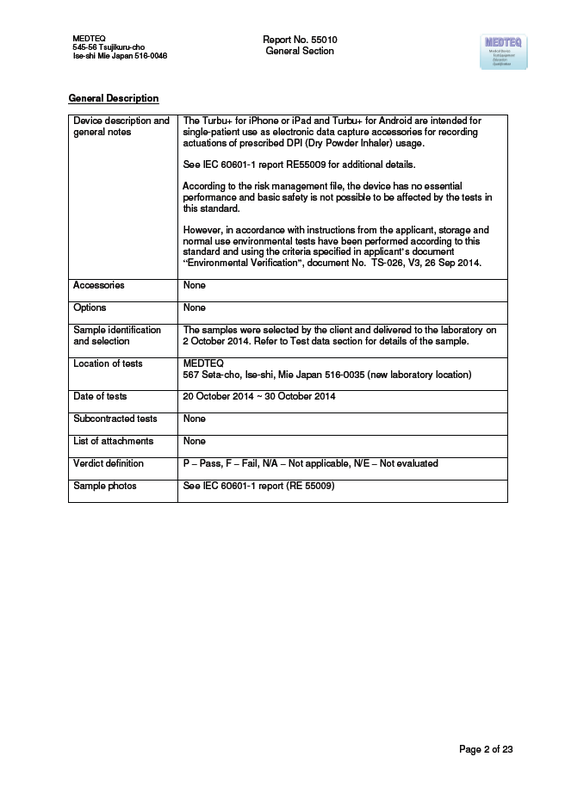 The reports contain a cover page, general description, sample identification (including photos), clause list (core evaluation), and test data. Unlike CB scheme reports, the test data section is a self contained record for all items inspected, measured or tested, with full details such as test engineer, sample identification, testing dates, environment, test equipment and methods used. This detail provides confidence for regulatory auditors. Testing may be useful for investigation before working with the bigger agencies, and also for specialized subjects like ECG, NIBP, IBP, HF surgery where the agencies may have limited experience. Past private clients (MEDTEQ reports) include ECG performance tests (IEC 60601-2-25, IEC 60601-2-27), ECG database testing (IEC 60601-2-47)/AAMI EC 57), HF surgical active electrodes (IEC 60601-2-2), clinical thermometers (ISO 80601-2-56), pre-submission testing and small battery operated for IEC 60601-1, Subcontract work for agencies includes ISO 8185 tests for humidifiers, and IBP sensors (JIS T 3323, based on AAMI BP 22). For services, customers can contact Peter Selvey for a quote. Prices are reasonable and for small amounts, convenient payment available, including using the Testing/Consultation fee blocks available on this website.